As I have written before, I am fortunate to be presented with different opportunities every one in a while. Miss B has a best friend, Master B (no relation), who she met in Kindy. As their friendship blossomed, we got to know his parents. As it turns out Mister B is into model trains, like I am, but the cherry on top was with his job as a driver for Kiwirail, he offered to take me on a ride in the cab of a freight train one day. This was a dream come true! I’ve been a train nerd for some time and how can you not be? I mean, come on, they are SO COOL! A thousand or so tonnes of steel and cargo, pulled by a thousand-plus horsepower engine, rolling along long, snaking tracks through New Zealand’s gorgeous countryside is appealing to admirers of engineering, physics, environmentally-friendly logistics AND aesthetics! I had previously travelled on the commuter trains in Wellington and Auckland, but the last time I had been on a train in Hawke’s Bay, was taking the Bay Express down to Wellington in the mid to late 90s, shortly before the passenger service was terminated. A few weeks ago he asked if I was free to go for a ride in the cab of a freight train to Woodville on Waitangi Day. He said there was a catch – He would have to pick me up at 4am. This was no catch – For more than a decade my (non-writing, but paying) job has seen my alarm go off at 3:30am six working days out of ten. With the excitement of the trip ahead of me I had been waiting outside, staring at the stars, for 15 minutes by the time he arrived to pick me up. In the cab of DL class locomotive number 9135 we leave the Napier yard not long after 5am and after rumbling through a slumbering central Napier, the throttles are opened and we started out along the Hawke Bay coast and over the Tutikuri and Ngaruroro river bridges at the (appropriately named, given the day) Waitangi Wetlands. Turning inland at Clive we go through the revitalised industrial and logistical hub of Whakatu before running right through the centre of Hastings. As we exit Hawke’s Bay’s major urban areas the train doesn’t immediately speed up a whole lot, as rail repairs and recent hot temperatures mean the pace is kept relatively slow in case rails have buckled, or moved in the heat. But that’s fine, because it’s safer and means I get to take in more of a view few get to see these days. One thing that stands out is all the cool old stations in places like Opapa and Ormomdville. Where small settlements were set up around these refueling and watering posts and local produce, goods and livestock would have been loaded and unloaded as little as 40-50 years ago, there are often just the station buildings remaining now. Crossing the braided Waipawa and Tukituku rivers is also very cool. Occassionally I look out the back window of the engine and watch the train’s wagons snake around curves behind us. After several more hills and bridges, rivers and sidings we reach the Ormondville Rail Viaduct – A rather impressive (and slightly more than impressively high) structure. For safety’s sake we cross it at 10km/h, but given its height, narrowness, and the fact it is taking the weight of our several-hundred-tonne train (and us) I am quite happy to be safely across it as quickly as practicable. Not long after that we are heading towards my destination of Woodville. The train will carry on to Palmerston North, but as I am not qualified/certified to go through the tunnels of the Manawatu Gorge in an engine, I must wait here for the driver to return. I end up having a decent wander round and seeing lots of little bits of this town many just pass through and, since the closure of the Manawatu Gorge road, many have bypassed altogether. Today, despite several more empty shops than last time I passed through, the town still seems quite busy – Likely with people on their way to see Phil Collins at Napier’s Mission Concert that night. As we drive back to Napier I get to reflect on what a great experience this trip had been. It’s always important to be open to new or different perspectives. Recent events in my life have certainly made this awareness somewhat stronger, and riding in a freight train has certainly been that. It would be great to see more trains operating in New Zealand again, especially when every wagon represents at least one less truck on already busy and often fast-deteriorating roads. And, as I stated at the beginning of this piece, I am fortunate to be presented with different opportunities every one in a while. When I was younger my Mum and Dad would often sit outside at night, looking at the stars and watching for satellites. I always thought it was a bit odd. I remember seeing Halley’s Comet in 1986 and wondering if I’d still be alive the next time it came by in 2061. Heavy stuff for a nine year old. In the early 2000s I watched a documentary series “Space” hosted by Sam Neill. The first episode showed just how small and insignificant we were in the universe and the second showed how easily we could be wiped off the face of aforementioned astronomical plane. 23 year old me felt insignificant enough as it was without the whole universe chiming in. I didn’t bother watching beyond those first two instalments. So space and the night sky filled with stars became a bit of a stranger to me. A passive aggressive bully, if you will. Then I became a Dad, my own Dad passed away, I had my own medical drama two years ago and then Mum died last February. I started looking at night sky again. Going outside when the International Space Station was due to silently streak high over New Zealand. Admiring just how bright and red Mars is as it rises in the eastern sky. I began admiring the passion and beauty Paul Le Comte and Ian Griffin put into and portrayed in their star photography. And maybe I was even thinking, hoping, a couple of those twinkles in the night sky might just be my parents looking down on us. Now at night I often stop for a minute, look up and quietly smile at the stars. Losing your parents can be a bit of a struggle. Not just the emotional and psychological turmoil, but whole volumes of history can vanish. “What were your mother’s parents’ names?” I was asked when organising Mum’s funeral. I honestly couldn’t remember. Grandad died before I was born and Grandma passed away before I was 5. Mum always used to say we were related to the late broadcaster Sir Paul Holmes somehow – something to do with a branch of her side of the family called “Manning” (this sort of stuff seemed to matter far more to the older generations, than to us younger ones). I can’t do that now. I can only really remember an nth of everything Mum and Dad told me about their growing up and our family history – We’re so busy focussing on our own learning and growing that so many things that might seem trivial at the time are left by the wayside. I do clearly remember one thing – It’s the house Mum and her parents lived in when they moved from Gisborne back to Napier. I remember its exterior very easily, because I see it almost every day – it’s just down the road from our current home! The interior, however, is much hazier. I remember tiny glimpses of the inside it from childhood, because I got to visit it briefly while my grandmother still lived there, and from the old photo albums I inherited. As fate would have it, the woman who presided over Mum’s funeral knew the family who live there. I asked afterwards if I could be put in touch to possibly have a look inside again and see if/how it had changed from my (very vague) memories. They happily obliged and a few months later I got to have a look around. It was an interesting experience on multiple levels. I brought some photos with me to compare the old and the new, so I will post them side by side. These are my maternal grandparents – Isabel and Allan, or “Peg” and “Knobby”. These photos are from around the same time and similarly sartorial. A rakish angle on Grandad’s trilby..
One memory I DO have of the interior of their house is sitting on the wooden stairs that led up to the second storey, staring at a stained glass window. The window is most certainly still there, and the stairs were carpeted long ago, but the odd thing was I remembered the stairs in reverse – I was certain they went up from left to right, when they actually go right to left. There had been a few other minor changes, but nothing of HGTV-knock-every-wall-out level. Much was as it had been 40 years ago. Even some of the drapes were original – How do I know? Here’s a picture of two of my cousins Alan and Jonathan Brough with our Grandma. The snooty looking critter on her lap is yours truly. I went up the (“back-to-front”) stairs and had a look around. My grandparents’ bedroom had apparently been on the ground floor, so upstairs was where Mum and her siblings would have slept. I had seen a photo of Mum, taken from the street looking up as she poked her head out of an upper window, but that room looked more like a sunroom / study. As I poked my head into another room, though, something told me “this was Mum’s room” – there was a connective feeling about it. (This was later confirmed by a cousin who had also been there regularly in their younger days). I took a few photos of the room (albeit with furnishings from the current occupants), perhaps hoping to catch a wisp of a spirit, a familiar face in a reflection, drape or pattern, but sadly none were to develop. I was asked if I wanted to be in any of the photos I was trying to recreate – “then and not”, or “a new generation” sort of thing, but I declined. It wouldn’t feel right personally. I didn’t feel like I deserved to take their places and I thought it spoke more of the loss I was feeling. The place was still here, but all those who connected me directly to it were gone and I was feeling that missing link. It had never been my home, but the occupants, and the house, had made me feel comfortable and welcome. It’s all part of the healing process, I guess. Many things may have been forgotten, but there are still lots of other things to be discovered. For over a decade now, Mrs InFrame has been coming up with a special 12-day menu to celebrate the “Twelve Days of Christmas”. She alternates each year between the traditional and the New Zealand version, otherwise known as “A Pukeko in a Ponga Tree”. This year was the Kiwi Christmas Deliciousness Edition! Most of the dishes have a direct correlation to the songs (Five Big Fat Pigs = Pork/Ham/Bacon), others use a fair chunk of artistic license as, with the original “Twelve Days” song we’d be swimming in poultry with French Hens, Swans a Swimming, Geese a Laying etc. etc. otherwise. I’ll do my best to explain as we go. This year’s menu plan is one that was SUPPOSED to be the one in 2016, but went missing just a few days before we were to begin and resurfaced, too late, on Christmas day (It was a Christmas miracle!). The blue of the cheese represents the Pukeko, while spinach represents the foliage and the flaky pastry looks like flakes off like Ponga Tree bark. Pretty straight forward here – Mrs InFrame baked the Kumara into chips to give them a lovely texture. Woven flax Kete are used as baskets and bags to carry things like berries, so we latticed the top of the Cherry Pie to give it a woven look. Huhu grubs are a creepy crawly delicacy at most “Wild Food” festivals, mainly for their gooey-squishiness when you bite into them, so filling tree-bark like Brandy Snaps with oohy-gooey whipped cream seemed a wonderful take on the idea! Five big Fat Pigs make a lot of pork mince and while they might not appreciate the alliteration of “Pork” and “Pepper” I’m sure your average Captain Cooker or Kuni-kuni would be quite happy munching on a fresh, crunchy capsicum. Mrs InFrame had the day off for this one, and our friends Tim and Junko from Tu Meke Don in Napier made us some rice balls to represent the soft balls that are swung on braided threads in Kapa Haka and other Maori songs and dances. They look like Poi, E(h)? Puha is a green, leafy green, wild vegetable that usually grows near water, so we made a watery Pho soup with mint, coriander (leafy green herbs) and meatballs. The Pipi Pizza Truck is a bit of an institution her in Hawke’s Bay – being on the first new wave of Food Trucks, so tonight’s pizza paid homage to the Pippi truck, rather than the bivalve mollusc. My boss had been fishing on Hawke Bay a week or so back and kindly gave us some of the snapper (fillets, not heads thankfully..) he had caught. It went perfectly with this Sri Lankan curry! The Haka is, of course, synonymous with New Zealand’s national rugby team, so it was fitting that we went to our usual café, Six Sisters, and had (All) Black coffee, with a rugby ball-shaped dollop of ice cream! Piupiu are a Maori grass skirt, as can be seen in the Poi e video above. When the dancer wearing it sways or spins the individual threads spread out a bit like octopus tentacles. When you split Frankfurters into quarters lengthways at one end and cook them, they split and twist upwards and outwards just like tentacles, or the swaying piupiu skirt. It also seemed like a novel way to close out this Twelve Days of Kiwi Christmas Deliciousness! We hope you’ve been inspired to try some of these, or your own version next Christmas. 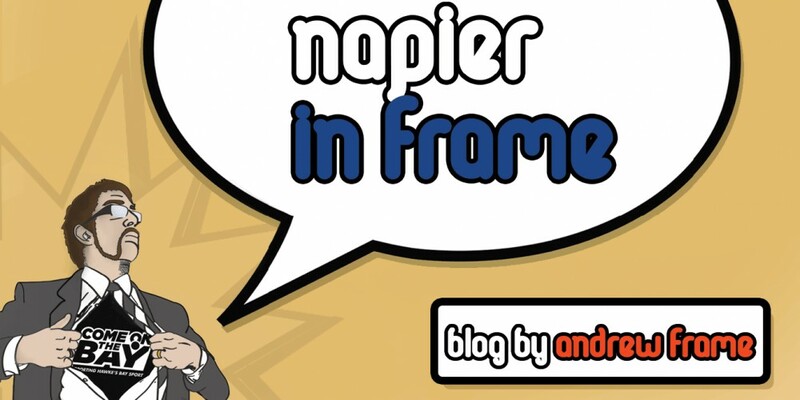 From the Napier in Frame family to yours, we wish you a Merry Kiwi Christmas and a safe and happy New Year! I’ve had to deal with a lot of big issues recently, so whenever I could I’ve tried to get away from the heavier stuff and focus on lighter, funner things. I needed a hero. I was holding out for a Pint Sized Hero. Standing at a grand 4-5cm high the Pint Size Heroes (or, “PSH”) are far more compact than their bigger 10cm high Pop! partners, but just a neat. With a growing range of figures now including comic book, movie, TV, gaming and other themes, I have taken a shine to the DC and Marvel cinematic universe characters. Part of the attraction of the PSH’s is they are sold as what is called “Blind Bags” – Like the “Lucky Dips” of our youth, you can never be sure of what you get. So it’s a pleasant surprise when you open the packet and get the Batman, or Back to the Future PSH you were after. If it’s one you don’t want, or already have there are now numerous groups on social media to buy, sell and swap “duplicates”. I like setting my PSHs up in dioramas and scenes. Funko hosts a regular “Pint Size Hero Happy Hour” – #PSHHappyHour on Twitter and people are always finding new, inventive and creative ways of presenting their figures. with an uplifting distraction recently.